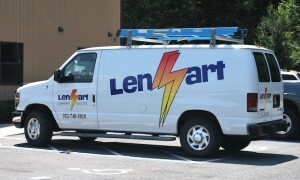 Among our many services, the Lenhart Electric service and repair department has electricians that are knowledgeable in commercial and residential wiring. In addition, we also have Residential New Construction and Commercial New Construction departments to start your next project with our team of expert professionals. At Lenhart Electric, our employees stand out for being prompt, professional and efficient. You will always be able to identify an electrician from our company by his company attire and service vehicle. All will bear our logo. Service, repair and additional electrical conveniences are our specialty! Contact us for your appointment 352-748-5818.